Nuremberg - Explore the Nuremberg Trials! 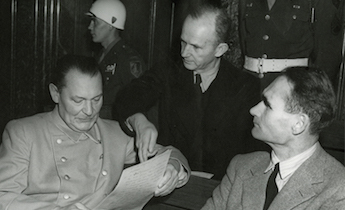 Search thousands of historical documents from the Nuremberg trials. 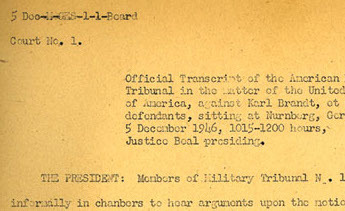 Examine trial transcripts, briefs, document books, evidence files, and other papers from the trials of military and political leaders of Nazi Germany. The Harvard Law School Library's Nuremberg Trials Project is an open-access initiative to create and present digitized images or full-text versions of the Library's Nuremberg documents, descriptions of each document, and general information about the trials. Documents used by the prosecution and defense during the trials. Sets of evidentiary material assembled by the war crimes staff for potential use in the trials. Verbatim records of proceedings in court, including witness testimony, oral arguments, and court rulings and judgments. Photographs of Nuremberg Trials defendants, judges, and trial activities. 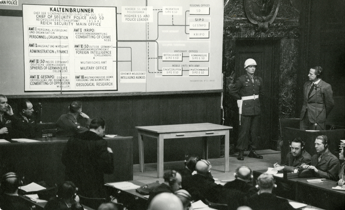 Uncover the topics related to the Nuremberg trials. Trial issues are criminal activities or subjects at issue in a trial that are addressed by a document. Usually these are prosecution charges—like crimes against humanity—or a defense response. Examine some of the collection's most-accessed trial topics. Access documents and transcripts related to specific people—defendants, authors, prosecutors, and more—involved in the trials. Start with these three high-ranking officers. Collections of documents assembled by IMT and NMT staff for possible use in the trials, evidence files provided nearly all of the documentary evidence used by the prosecution. The documents were organized into sixteen subject groups. Here are a couple of the most interesting. Whatever book or treatise on medical ethics we may examine, and whatever expert on forensic medicine we may question, will say that it is a fundamental and inescapable obligation of every physician under any known system of law not to perform a dangerous experiment without the subject's consent. Currently, we have been able to make available the full, keyword-searchable text of four trial transcripts, documenting the verbatim daily proceedings of NMT Trials 1, 2, 3 and 7, ranging in extent from 4,000 to 12,000 pages each. They include witness testimony, the presentation of exhibits, oral arguments by counsel, and rulings by the tribunal. As of fall 2016, we have digitized images of all 650,000 pages of documents and transcripts in the collection and have provided searchable text for 5 of the 13 transcripts using corrected OCR. We have completed full document analysis -- and created searchable metadata for -- the document collections of 5 of the 13 trials.